The disciples were instructed to preach of the remissions of sins and the need of repentance among all nations for the salvation of man, and were told to wait for the power from on high that is the promise of the holy spirit! 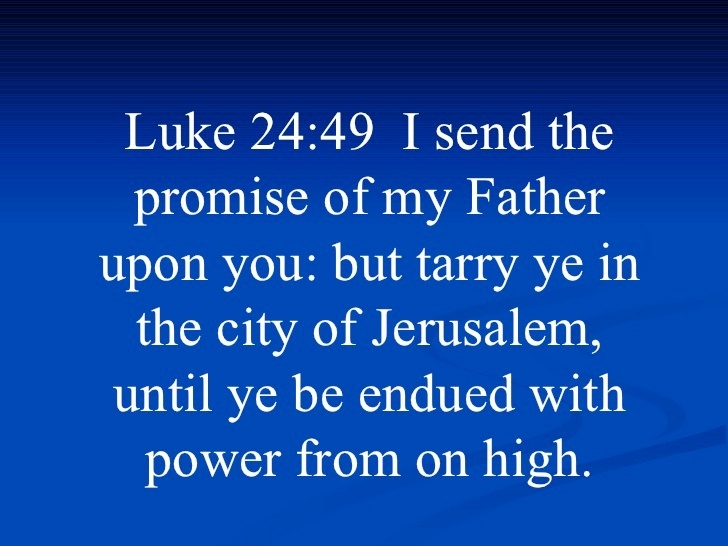 (Luke 24:45-49). 45 Then opened he their understanding, that they might understand the scriptures,46 And said unto them, Thus it is written, and thus it behooved Christ to suffer, and to rise from the dead the third day:47 And that repentance and remission of sins should be preached in his name among all nations, beginning at Jerusalem.48 And ye are witnesses of these things.49 And, behold, I send the promise of my Father upon you: but tarry ye in the city of Jerusalem, until ye be endued with power from on high. Although none of us know the times and seasons that is in Gods power, we can however by the power of the holy spirit be His witnesses throughout the earth as He has called us to do just as He did the apostles(Acts 1:2-8). When Peter said unto the lame man “In the name of Jesus Christ of Nazareth rise up and walk. And he took him by the right hand, and lifted him up: and immediately his feet and ankle bones received strength” the people ran to him and were filled with wonder and amazement. Peter did not take credit for the miracle but told them that by faith in Jesus name was the man made strong and that it was the power of God(Acts 3:1-16).